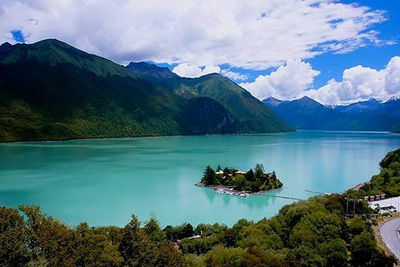 Draksum Lha tso — also called “the Tsogo lake” — is a famous sacred lake located in Kongpo Gyamda county, 55km to the east of Kongpo Gyamda and 300 km from Lhasa. Built in the middle of the lake, the Nyingma temple Tsodzong Gongba was built in 17th century. Kongpo (Tib. ཀོང་པོ་, Wyl. kong po) is one of the three main regions comprising South Eastern Tibet. Over 50% of Kongpo is made of forest, and the climate in it is mild and humid. This page was last edited on 27 April 2017, at 06:17.